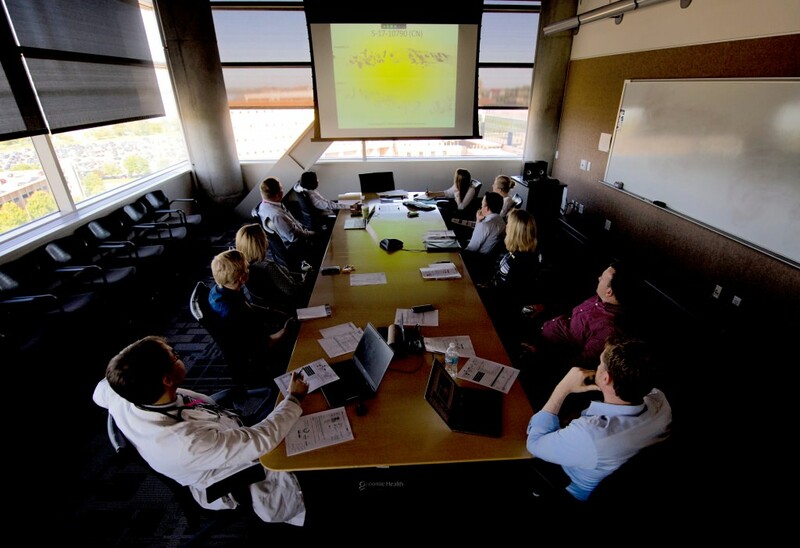 In a darkened room in a campus research tower, about a dozen oncologists, pathologists, pharmacists and geneticists from UW Health discussed images and data on dangerous tumors afflicting patients from across Wisconsin. By focusing on genetic (“molecular”) abnormalities, the tumor board serves as a kind of brain trust for Wisconsin’s cancer doctors and patients: a way to direct the firepower built by the hundreds of years of study, training, practice and experience present in this room, against a disease affecting patients in the state’s 72 counties. The board is a partnership between the UW–Madison Carbone Cancer Center and regional medical centers, including Gundersen Health System, Green Bay Oncology and Aurora Health Care. And then, as Parsons described her “exceptional response” to the targeted drug crizotinib, the images showed her tumors receding, even disappearing. The decision to use crizotinib, he says, was made at Gundersen, but reinforced during the October discussion with the tumor board. The patient’s identity is now known: We’ll call her “Lisa” for privacy. A mother of four from rural Viroqua, Lisa became the first breast cancer patient known to be successfully treated with crizotinib, a drug designed for a certain type of lung cancer. In September 2015, a lump in Lisa’s breast was diagnosed as cancer that had spread to the lymph nodes. The “triple-negative” cancer was insensitive to standard drugs that target estrogen or the protein HER2. In March 2016, the cancer seemed headed for remission, but by summer, it came roaring back. In October, Parsons, Paraic Kenny, a scientist who specializes in precision oncology with the Kabara Cancer Research Laboratory at the Gundersen Medical Foundation and an adjunct clinical associate professor at UW–Madison, and colleagues at Gundersen used high-intensity gene sequencing to discover a “driver mutation” called MET. Driver mutations trigger a cascade of cell growth signals and are a logical target for precision cancer treatment. Lisa started the drug in October, and like a Christmas gift right on schedule, scans performed just before the holiday showed a rapid shrinkage or disappearance of the tumors, she says. This is a cost-free service to the cancer patients in Wisconsin and beyond, part of the commitment of the Carbone Cancer Center to our state. The Molecular Tumor Board is a response to the growing recognition that genes may supersede the source organ (such as breast or liver) in guiding treatment. As genetic analysis gets cheaper and faster, expensive drugs that target specific genetic signatures are often the most promising avenue of cancer treatment — and sometimes the only one. As cases from around Wisconsin are presented to the board, the blizzard of genetic shorthand (“a rearrangement of the NF1 gene and a loss of the CDKN2A/B gene”) reinforces the complexity problem. Extending the symptom-free lifespan relies on overcoming the growing complexity of treatment decisions, Burkard says. The MET abnormality, for example, appears in less than 1 percent of breast cancers, so a test of the MET inhibitor crizotinib against all breast cancers would fail — even if it did help the rare patients with the abnormality. In May 2017, for the first time in history, the Food and Drug Administration approved pembrolizumab, a drug for any type of cancer containing a rare, specific DNA pattern, regardless of origin. In fact, Burkard hopes that, as the record for precision medicine improves, oncologists will turn to the tumor board earlier in the treatment process. “The price of gene sequencing is falling steadily, and the number of targeted compounds is going up,” he says. “We think we can prolong symptom-free survival and reduce suffering if we’re brought into the process sooner. Parsons and his colleagues will shortly publish a report on Lisa’s case in Precision Oncology, an offshoot of the Journal of Clinical Oncology. “We are really just starting to understand ‘personalized medicine’ in oncology,” Parsons says. “This is definitely starting to pick up steam. We are discovering new targets and new effective drugs faster than we ever have before. There are no guarantees in life, or in cancer, but Lisa accepts the uncertainty. With four children between the ages of 13 and 19, she’s enjoying a new lease on life.